HEAT EXCHANGER – ООО "ХИММАШ-АППАРАТ"
Heat transfer processes are carried out in heat exchangers of various types and designs. Mixing heat exchangers for surface design easier: they use the heat better. But they are useful only in cases where due to technological conditions of production permissible mixing environments. Surface heat exchangers, in turn, are divided into recuperative and regenerative. In recuperative heat exchangers heat transfer between different coolants is through partition walls. Wherein the heat flow maintains the wall at each point the same direction. In regenerative heat exchangers heat transfer alternately in contact with the same heating surface. The direction of heat flow into the wall at each point varies periodically. 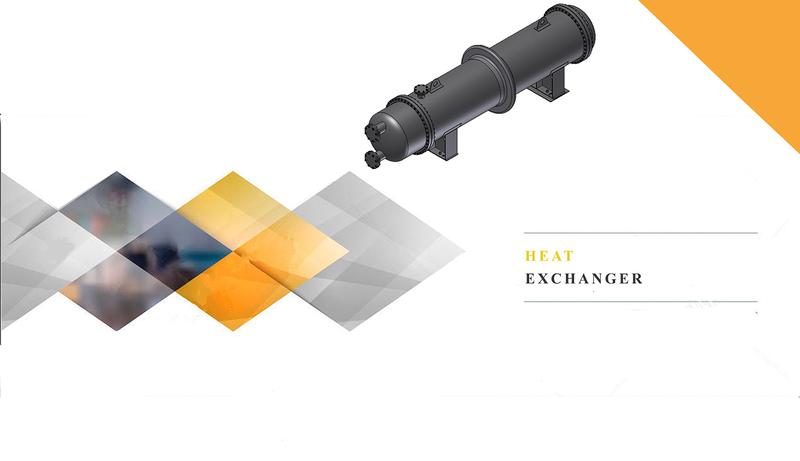 These heat exchangers consist of a series-connected element sections. A combination of several ele ments with a small number of pipes corresponds to the principle of multi-pass shell and tube apparatus working on the most profitable scheme – countercurrent. Element heat exchangers effective when coolants move with comparable speed without changing the state of aggregation. They also advisable to use a high-pressure environments. The absence of partitions reduces the hydraulic resistance and reduces the degree of contamination of the annulus. However, compared with multiple heart exchanger coils Element heat exchangers less compact and more expensive due to the increase in the number of expensive components of the apparatus, tube sheets, flanges, expansion joints and other. Surface heat exchangers composed of a twisted series of concentri c coils, encased and protected by the relevant heads. Heat transfer fluids move along the tube and shell side spaces. Twisted heat exchangers are widely used in high pressure apparatus for separation processes of gas mixtures by deep freezing. These heat exchangers are characterized by their ability to self-compensation sufficient for the perception of strain from thermal stress. Irrigation heat exchangers are a series of one above the other straight pipes, irrigated with water from the outside. Pipes are connected by welding or flanges using “belts” Irrigation heat exchangers are used mainly as refrigerators for liquids and gases, or as capacitors. Irrigated water is evenly spread through the chute on top with scalloped edges. Water scrubbing tube is partially vaporized, resulting in its irrigation flow heat exchangers is somewhat lower than in other types of refrigerators. Irrigation heat exchangers – rather cumbersome apparatus; they are characterized by low intensity heat, but easy to manufacture and use. They are used when small capacity is required, as well as chemically aggressive cooling media or the need to use special heating surface of materials (e.g., for acid cooling devices of acid resistant material ferrosilid that is poorly processed). Heatexchanging devices of this type consist of a number of series-connected units. 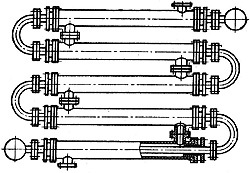 Each lin k consists of two coaxial pipes. For easy cleaning and replacement inner tubes are usually interconnected or tribes. 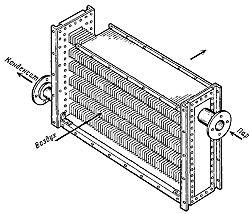 Double-tube heat exchangers with a large heating surface consists of a number of sections, connected in parallel collectors. If one of the coolant is saturated with steam, it is usually fed into the tube (annular) space. These heat exchangers are often used as a liquid or gas. Sizing of the inner and outer tubes can provide both working media participating in the heat transfer needed to achieve a high rate of heat transfer rate. Advantages of double-pipe heat exchanger: a high heat transfer coefficient, suitable for heating or cooling media at high pressure, ease of fabrication, installation and maintenance. Disadvantages of twin-tube heat exchanger – bulkiness, high cost due to the large consumption of metal on the outside of the pipe, not participating in the heat exchange, the complexity of cleaning the annulus. Finnede heat exchangers Finnede heat exchangers used to increase the heat exchange surface of ribbing from the other side, which is characterized by the highest thermal resistance. Finned heat exchangers (heaters) are used, for example, by heating with steam or air gases. An important condition for efficient use of edges is their close contact with the main pipe (no air layer) as well as rational placement of the ribs. <br><br>Finned heat exchangers are widely used in dryers, heating systems, such as economizers and air coolers. In spiral heat exchangers heating surface is formed by two thin metal sheets welded to the partition wall (cores) and folded in the form of spirals. To impart rigidity and strength sheets, as well as fixing the distance between the spirals to the sheets with spacers welded on both sides of the boss. Spiral channels rectangular end cap limited. Seal channels in the spiral heat exchanger is carried out in various ways. The most common way in which each channel on the one hand brewed and the other flat seal gasket. This prevents mixing of coolants, and in case leakage napkin can leak out only one of the heat carriers. Furthermore, this method makes it possible to easily seal the channels to clean. If the gasket material collapses one of coolants, one brewed channel on both sides (“shut” channel) and the other flat seal gasket. In this case, “shut” channel is not available for mechanical cleaning. Flat gasket seal both open (through) channels are used only in those cases where a mixture of working environments (for tightness) is safe and does not cause damage to heat transfer. Transverse channels can also be sealed at more or less constant pressure in the ducts, spiral U-shaped cuff is pressed against the internal pressure force to the projections in the lid. Spiral heat exchangers are compact, low pressure drop and heat transfer considerable intensity at higher coolant velocity. Heatexchanger unit spiral-radial type can be used for heat transfer processes of liquids and gases in power, chemical, petrochemical, oil refining, metallurgical and other industries. The diagram shows the new heat exchanger design. Heat transfer surfaces are formed of mutually welded along the contour of the corrugated or flat sheets. In a section perpendicular to the axis of the apparatus, the sheets are shaped Archimedes spiral. Mutually welded plates form internal cavities, which communicate with the inlet and outlet streams of a medium and the outer surface of the outer sheet to form a cavity communicated with the inlet and outlet of the other flow medium. Corrugated sheets, turn 180 °, flush with each other. Hydraulic resistance of the medium flow in the heat exchanger of the new design is lower than traditionally used in heat exchangers. The design of the device allows you to create heat exchangers to a predetermined pressure loss. 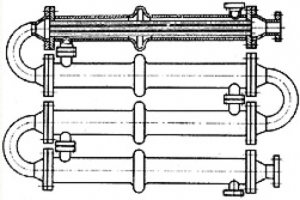 This design of heat exchanger is about 2 … 3 times smaller and lighter than plate heat exchangers 7 and 10 times … – shell and tube heat exchangers. heat exchangers with spiral-shaped grooved heat transfer surfaces can be used for high differential pressures and temperatures heat exchange medium. In forming the heat transfer surfaces of the heat exchanger of the flat spiral sheets may conduct heat exchange process gas or liquid containing suspended solids.